Pure Lavande is but a small part of a bigger outlook called Le Chateau du Bois. The Lincele family with their fierce determination of searching and producing pure lavender are the owners of the unique Le Chateau du Bois. The chateau is their home, where they have brought alive their passion in the form of great Lavender farms. 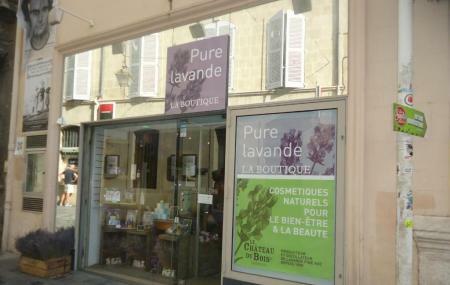 Pure Lavande is a speciality gift shop that sells the organic, cosmetic products of Lavender that The Chateau du Bois is so proud of. Traditional methods of agriculture are used to cultivate fine lavender which is glorious in its precious medicinal properties. This very bottle goes into the bottle of essential oils and perfumes and other products that you shall find in Pure Lavande. The Lavender has been the symbol of Provence since the 16th century. The Chateau produces an array of products of this symbolic flower after working day and night in the research and development of the plant. To rub away your worries or to just make someone feel special, stop by at Pure Lavande and buy a floral gift. How popular is Pure Lavande? People normally club together Hammam Chiffa and Museon Arlaten while planning their visit to Pure Lavande.